They filled every row on the main level and all the seats in the mezzanine, stood at the back of the room and even sat on the floor and in the window alcoves. 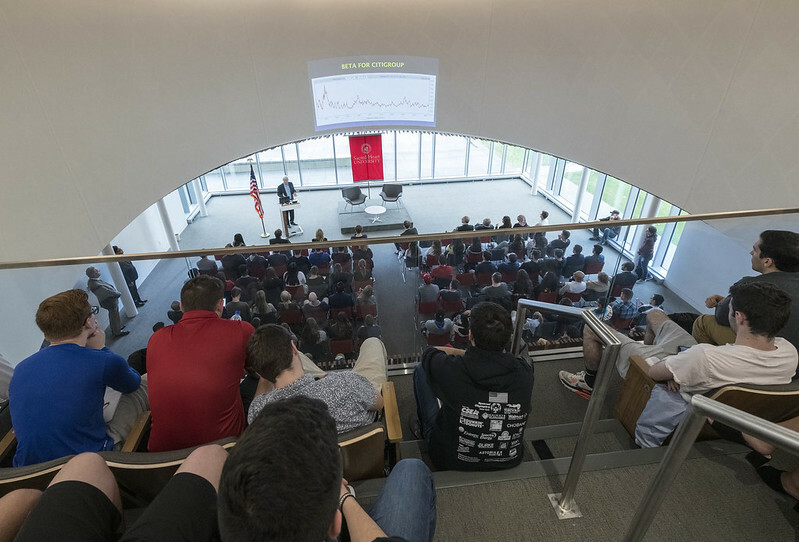 Hundreds of students, faculty, community members and press comprised the enthusiastic throng that filled the Martire Forum at Sacred Heart University’s Jack Welch College of Business recently, eager to hear Robert F. Engle share his thoughts on the world’s financial climate. Sponsored by SHU’s Center for Applied Business Research, Engle titled his talk, “How Much SRISK is Too Much?” It’s a topic with which he is intimately familiar as the Michael Aremellino Professor of Finance at New York University’s (NYU) Stern School of Business and winner of the 2003 Nobel Prize in Economics for his research on the concept of autoregressive conditional heteroscedasticity. Engle’s presentation centered on the premise that undercapitalized financial firms are vulnerable to external shocks. He discussed means to measure systemic risk and lessen the chances of another financial collapse. Engle compared financial markets to a seemingly inactive volcano—it looks sedate, but there’s a wisp of smoke. Is it really dormant or potentially volatile? In finance, big swings would be the outward indicator of volatility. He pointed to the V-Lab at NYU as a group that analyzes volatility, along with climate, liquidity and fixed income risk. Engle said banks should also audit for risk internally and, when they recognize it, they take their own actions to mitigate it, “but what they do actually creates a crisis,” he said, noting excessive credit growth as the fundamental cause of financial crises. “A bank may issue a mortgage to an underqualified borrower or for an undervalued house. These mortgages will have market values that may be less than the accounting value and, if the housing market declines, the market value will fall further as the collateral weakens. The bank has to cover the gap with reserves and, if it doesn’t have a sufficient capital cushion, then it will face bankruptcy or seek a bailout,” Engle explained. The amount necessary to bail out a financial institution is hard to determine, he said, as banks have a stock market value that is in constant flux, and volatilities are changing all the time. In the Great Recession of 2008-09, Citigroup was deeply affected, as it carried a lot of mortgage debt. Another example of volatility is Britain’s retreat from the European Union (known as BREXIT), which affected Barclays Bank. So, where is the risk? Engle said that, among countries, the top five that would need the most bailout money are China, which would need $1 trillion, followed by Japan, France, the United Kingdom and United States. Among U.S. banks, Engle identified the top five as Citigroup, which would need $48 billion to recapitalize, Prudential Financial, Goldman Sachs, MetLife and Lincoln National. Many insurance companies also have not reduced their debt risk, he said. On Aug. 29, 2008, two weeks before Lehman Brothers declared bankruptcy (which launched the recession), the greatest risk carriers were Citigroup, followed by J.P. Morgan, Bank of America, Morgan Stanley, Freddie Mac, Merrill Lynch, Fannie Mae, American International, Goldman Sachs, Wachovia and Lehman, Engle said. The Federal Reserve rescued the banks that were the most systemically important, he said, but the government should not be rescuing banks. Rather, it should be preventing them from failing, which is partly what the Dodd-Frank bill aims to address. What do firms with high SRISK do to address it? According to Engle, sometimes they won’t do anything. Other times, they may sell new shares of stock, or they may sell assets and retire debt. “Each strategy has its own risk; none is foolproof,” he observed. Yet, banks inherently want to take more risk because they don’t mind if the downside spills over to the rest of us, he said, which is why there’s regulation.